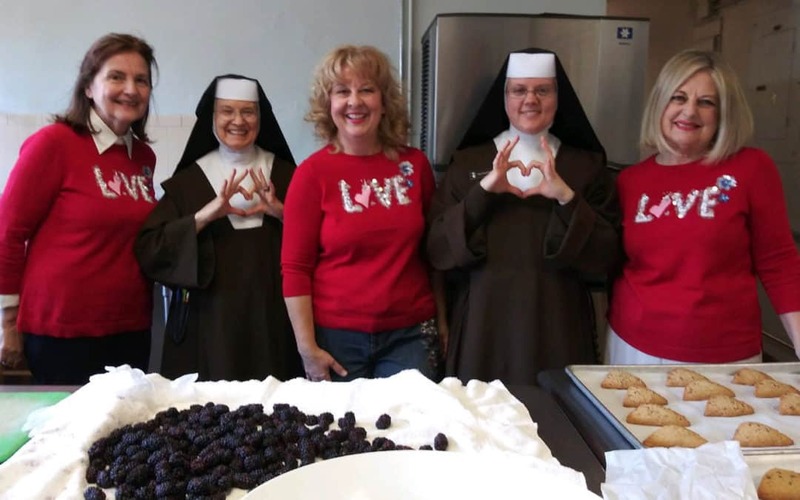 A few years ago, a friend of our younger sister Cynthia suggested that she volunteer in the kitchen at the Sacred Heart Retreat House because she loves to bake so much. We three Vartanian sisters had all attended prior Fall Boutiques and so we were familiar with the Carmelite Sisters and the Retreat House. We also knew of the Sisters through our parish, Holy Family Church. In August of 2017, Cindy started to volunteer in the kitchen and loved it so much, she encouraged the other two of us to volunteer as well. We can still remember the day when she called to tell us about her day at the Carmelite Kitchen! The energy and joy in her voice as she recounted her time with Sister Mary Joanne and team was contagious. Cindy went on to tell us that she was also served a delicious lunch by Pete from the kitchen staff. She was on top of the world! By the way, Pete makes the BEST burgers! After a recount of her day with these beautiful sisters, Cindy told us that preparations were already in place for the November Family Boutique and that volunteers were needed. She said there were a variety of tasks available that included cooking, housekeeping, office assistance and more. Before we knew it, she arrived at our home with applications in hand, which we promptly completed. In a short time, all three of us were part of the Carmelite Sisters Family! In the beginning, we participated in a variety of tasks from housekeeping to helping in the kitchen with the final detail of labeling Sister Mary Joanne’s delicious jams and jellies. Our God has blessed us all with special gifts and talents and we believe He holds us accountable to be good stewards in sharing those gifts and talents. We look forward to setting aside a block of time each week to assist the Sisters in the kitchen and in the Main Office of the Retreat House. Our experience volunteering at the Sacred Heart Retreat House has given us joy beyond measure. When we are volunteering, we are in a sense, on retreat. Through our work with the Sisters and the staff, we are blessed and filled with much personal satisfaction. We always seem to leave the retreat house with greater inner peace and with a sense of accomplishment. We are very grateful for all that we have learned in the kitchen and office as volunteers, most especially, how to love as St. Paul describes in 1 Corinthians 13. What a blessing it is to work side by side and in the company of wise, holy, spiritual, selfless, religious women who are doing the work of the Lord each day with such joyful hearts! Throughout our lives, we have always been inspired by beautiful women and the Carmelite Sisters are among the most beautiful, inspirational women we have been blessed to know. Thank you dear Carmelites.